JK 310 series Staples, 1/2-inch Crown, 20 Gauge. Galvanized. 5,000 staples per box. Fasco brand, made in Europe. Interchangable with Bostitch STH 5019 staples. Fit all JK310 series staplers. 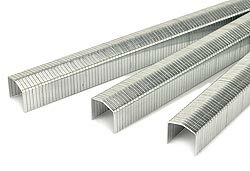 STH5019 3/8-inch staples. Galv. 5000/box. Made in Europe.